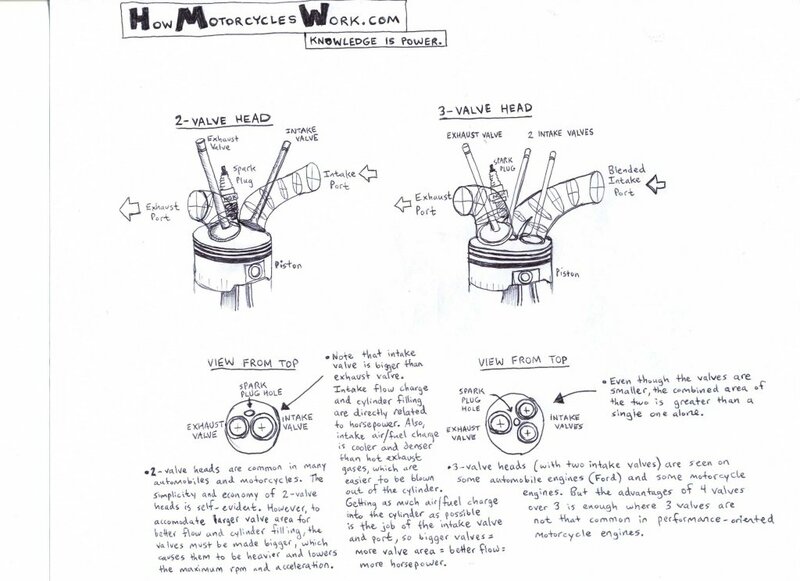 how motorcycles work.com knowledge is power. 2-valve head. 3-valve head. Exhaust valve intake valve spark plug intake port piston exhaust port blended intake port view from top spark plug hole exhaust valve intake valve. 2-valve heads are common in many automobiles and motorcycles. The simplicity and economy of 2-valve heads is self-evident. However, to accomodate larger valve area for better flow and cylinder filling, the valves must be made bigger, which causes them to be heavier and lowers the maximum rpm and acceleration. Note that intake valve is bigger than exhaust valve. Intake flow charge and cylinder filling are directly related to horsepower. Also, intake air/fuel charge is cooler and denser than hot exhaust gases, which are easier to be blown out of the cylinder. Getting as much air/fuel charge into the cylinder as possible is the job of the intake valve and port, so bigger valves = more valve area = better flow = more horsepower. View from top. Even though the valves are smaller, the combined area of the two is greater than a single one alone. 3-valve heads (with two intake valves) are seen on some automobile engines (Ford) and some motorcycle engines. But the advantages of 4 valves over 3 is enough where 3 valves are not that common in performance-oriented motorcycle engines.